Pro cassette. Limited to 100. Latest full length from the long running Kadaver. Torturous and trauma inflicting distortion drenched harshness hybridized with more aloof and introverted moments of audial decay and misery. Reissue of the long sold out and sought after Italian Death Industrial classic from 2004. 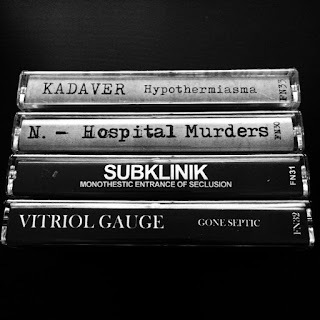 Withdrawn sounds of mental disconnection, empty hospital corridors, abandoned asylums, chloroform sleep. Utter dread and isolation. 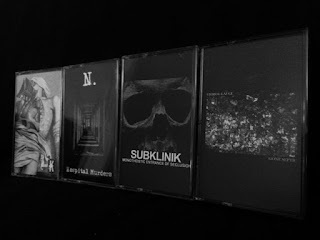 SUBKLINIK "Monotheistic Entrance Of Seclusion"
7 years since Subklinik was last released on Fall Of Nature, presented here is the full length from 2015 on limited tape format. 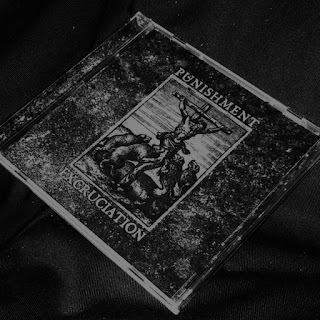 "Monotheistic Entrance Of Seclusion" embraces a more ambient spectrum to deliver it's sermon of death worship and monolithic sepulchral darkness. Cold, misanthropic Death Industrial from the USA. Heavy, imposing and impressively structured, A strong sense of brooding hatred, impending violence. "Gone Septic" is a callous and impenitent statement of keeping Industrial/Noise unapologetic and hard as nails.